Works with Amazon Alexa Echo for voice control,60w equivalent. Free Tuya APP for iPhone and Samsung Galaxy or other smart phone.With this app you can manage you lights by smart phone or tablet , including adjusting brightness, setting schedules and scenes! 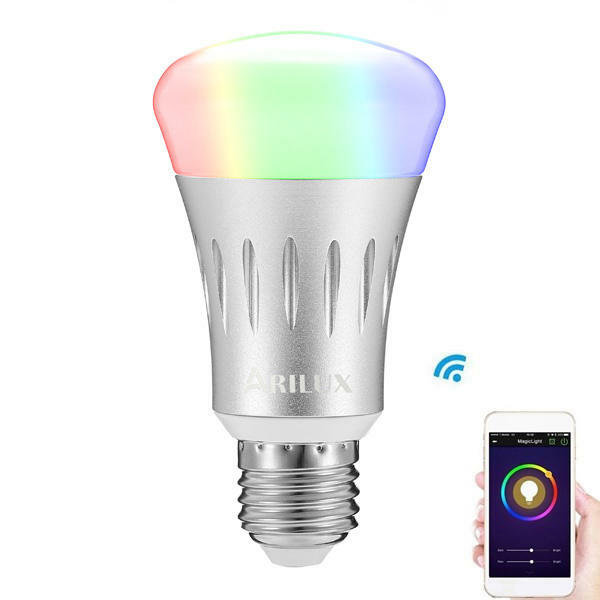 Color change & scenes:This WIFI light has over 16 million colors and a variety of tones of white, and every color is dimmable. you can change the color form blue to green, red to yellow;even change the light from plain to bright! Just DIY your rooms with your favorite colors! Use the "Reading" mode when you want to read favorite books and use the “Leisure” mode when you take a nap or listening music.Perfect for home, store, super market, office, KTV, party, and other lighting and decoration. Remotely and group control: Create a group ,control more than one bulb to work at the same time! Control your led lights at any time and place in the world with your smart phone or tablet - Check if you had forgotten to switch your lamp off before you left home; And switch them on before you come home. Never worry come home with dark house! Schedule actions: Schedule your bulb to turn on or off at specific time. Wake up in the morning to your favorite colors. Improve your home security when you are not home by scheduling your lights to turn on and off giving the appearance that you are home. Just have your smart lights work around your life! Note:Our WIFI light only supports 802.11b/n/g 2.4GHz WIFI HOTSPOT, not support 5.0GHz WIFI HOTSPOT.